When Roberta (Bobby) Redman started occasionally mixing up her words around four years ago she put it down to simply being a bit tired and overworked. 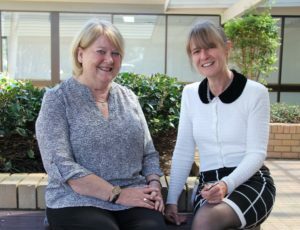 At age 65, the Daleys Point resident thought she was “burnt out” and decided it was time to retire from her job as a psychologist. “I would occasionally use the wrong words in the wrong places and sometimes wasn’t making complete sense but I just put it down to my age,” she said. But when Bobby visited her old friends in England they noticed more significant personality changes that made her worry. “They asked if I was okay as I was suddenly snappy and on edge,” she said. Despite initial scans and tests being clear, Bobby asked for a referral to see a neurologist. “After a thorough investigation the neurologist diagnosed me in the early stages of frontotemporal dementia (FTD),” she said. Bobby has now teamed up with Central Coast Local Health District (CCLHD) to promote Dementia Awareness Month (September) in order to build greater understanding of dementia including how to recognise and manage the condition and local support options. CCLHD Geriatrician Dr Tomiko Barrett said dementia was the overarching term for a number of neurological conditions marked by a decline in brain function. “Dementia affects everyone in different ways and people living with dementia can find their own approach to managing changes associated with dementia,” she said. When diagnosed with FTD, Bobby was concerned to discover it affected the part of the brain involved in social behaviour, judgement and self-control but she was determined to do everything she could to slow down the disease. “I made immediate lifestyle changes that involved increasing my physical exercise; changed my diet and cut sugar out; started doing brain exercises and meditation each day,” she said. One year after Bobby’s initial diagnosis, she was pleased to hear her neurologist say the dementia showed no signs of advancement. Bobby continues to undergo neuropsychological assessments and examinations to monitor the disease. She says her cognitive impairment can still be challenging at times. Dr Barrett said if you are concerned about dementia to talk to your GP. “Early investigation and diagnosis may find reversible risk factors or help slow the progression,” she said.